Psoriasis is fundamentally an immune system problem. 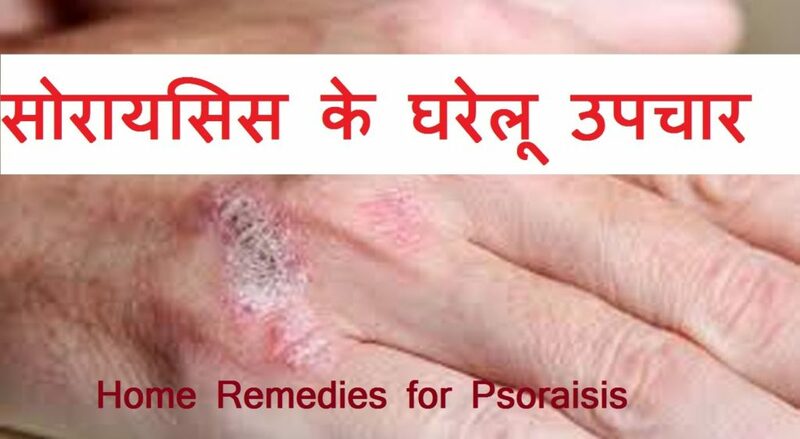 Psoriasis is a noncontagious, chronic skin disease that produces plaques of thickened, scaly skin. The dry flakes of silvery-white skin scales result from the excessively rapid proliferation of skin cells. The proliferation of skin cells is triggered by inflammatory chemicals produced by specialized white blood cells called T-cells. Psoriasis commonly affects the skin of the elbows, knees, and scalp. Though psoriasis signs and symptoms vary from person to person, psoriasis types are typically identified by their hallmark appearances. Here’s a look at psoriasis photos, showing classic signs and symptoms. Plaque psoriasis is the most common type of psoriasis. The AAD estimates that about 80 percent of people with the condition have plaque psoriasis. It causes red, inflamed patches that cover areas of the skin. These patches are often covered with whitish-silver scales or plaques. These plaques are commonly found on the elbows, knees, and scalp. Erythrodermic psoriasis is a severe and very rare type of psoriasis. This form often covers large sections of the body at once. The skin almost appears sunburned. Scales that develop often slough off in large sections or sheets. It’s not uncommon for a person with this type of psoriasis to run a fever or become very ill. This type can be life-threatening, so individuals should see a doctor immediately. 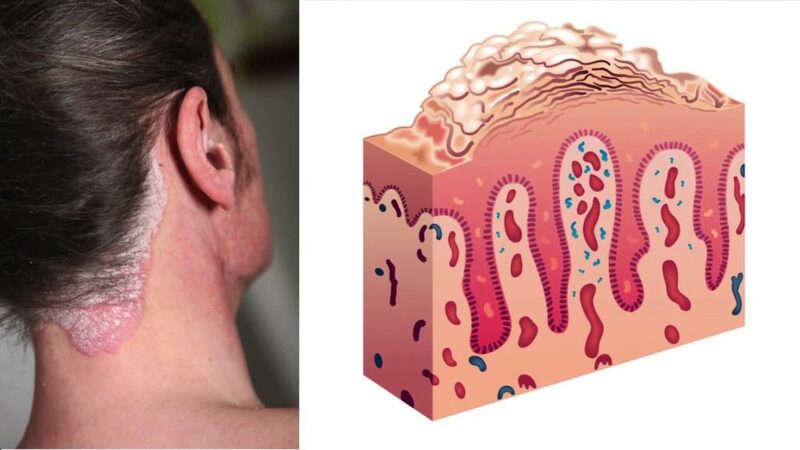 Plaque psoriasis signs and symptoms appear as red or pink small scaly bumps that merge into plaques of raised skin. Plaque psoriasis classically affects skin over the elbows, knees, and scalp and is often itchy. Although any area may be involved, plaque psoriasis tends to be more common at sites of friction, scratching, or abrasion. Fingernails and toenails often exhibit small pits (pinpoint depressions) and/or larger yellowish-brown separations of the nail from the nail bed at the fingertip called distal onycholysis. Nail psoriasis may be confused with an incorrectly diagnosed as a fungal nail infection. Psoriasis can be caused by a variety of reasons. Heredity can be crucial. If one parent is affected, then there is 15% of chances for the child to suffer from psoriasis. If both the parents are affected then the possibility of a child getting the psoriasis is 60%. Consumption of opposite foods (such as fish and milk together), trauma on the skin like cuts, bruises or burns, some medicines or skin irritants, excessive smoking, alcohol consumption, and mental stress or psychological trauma can also be responsible for causing it. 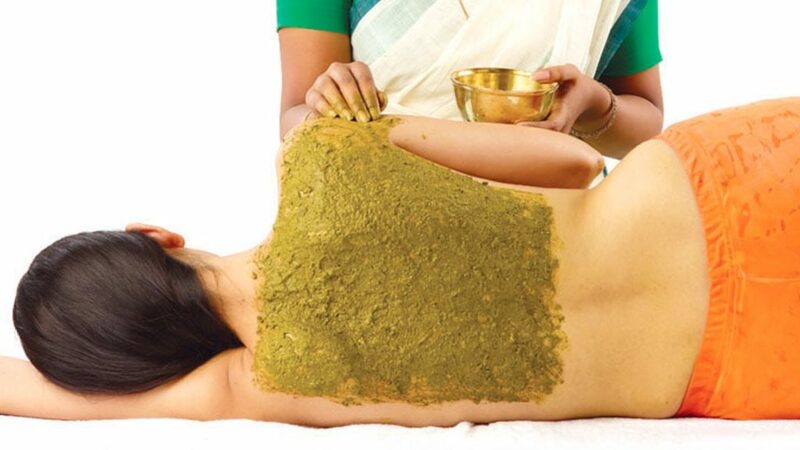 These are meant to detox and purify the body. A vegetarian diet is often recommended.